For years and years I’ve made these jars. 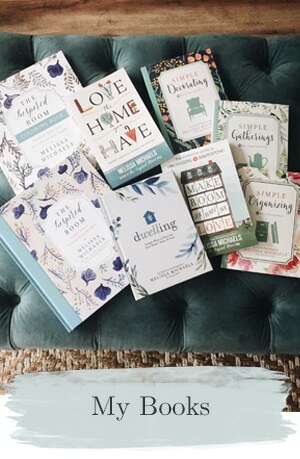 They are my GO TO decorating idea for just about any event. 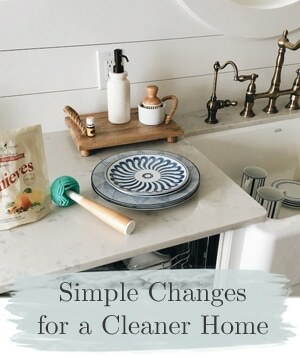 They are pretty, easy to use and make and are always a HUGE hit! 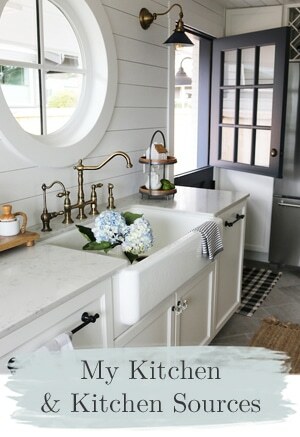 I’m a big fan of simple pretty ideas. 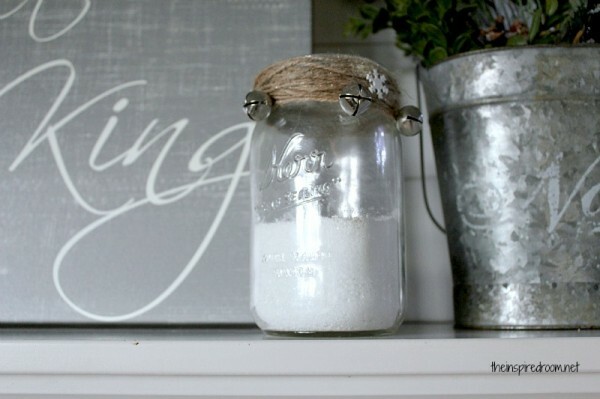 I use Epsom salt as glittery snow in my mason jars! I love it. I buy it at the grocery store and keep it on hand all year. 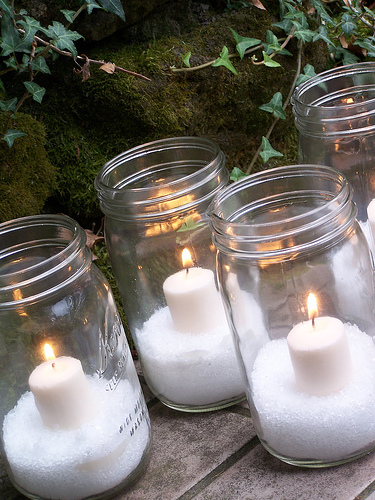 Every once in awhile I refill my mason jars with fresh “snow” and a new candle. Can Christmas decorating get any easier than that? I think not. 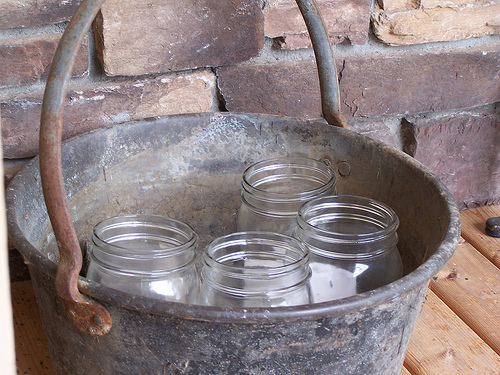 These mason jars sit on my porch all winter and make me look like a Martha Stewart hostess. It looks all sparkly and pretty and is completely safe even when used with real flames! And no, the Epsom salt doesn’t burn. But as always, you are responsible for your own safety. I recommend you use white candles. Red will make it look like there was a massacre in your jars. You can also use the Epsom salt to look like SAND in the summer! So versatile! 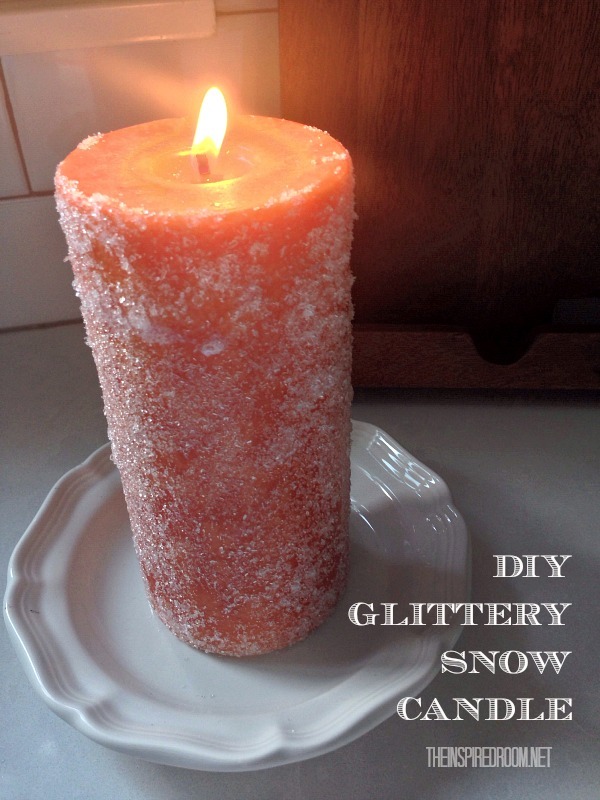 Here is another SUPER cute idea for how to use Epsom salt “snow”…I saw this over at my friend Emily’s blog (and finally made my own!). And easy? Yep. 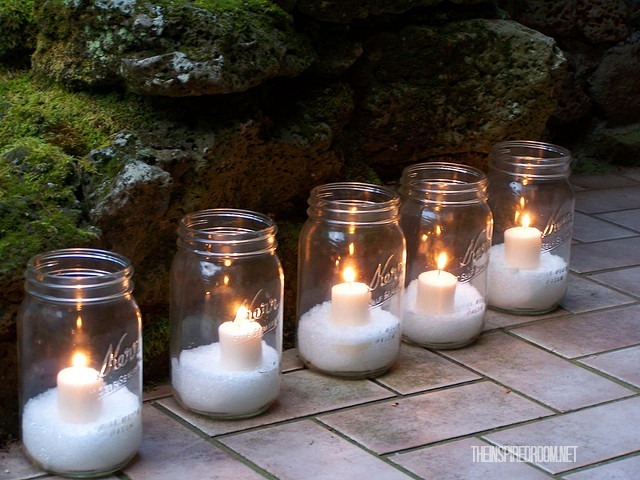 Just roll your candle in Mod Podge and then in Epsom salts. EASY! It doesn’t have to be perfect! 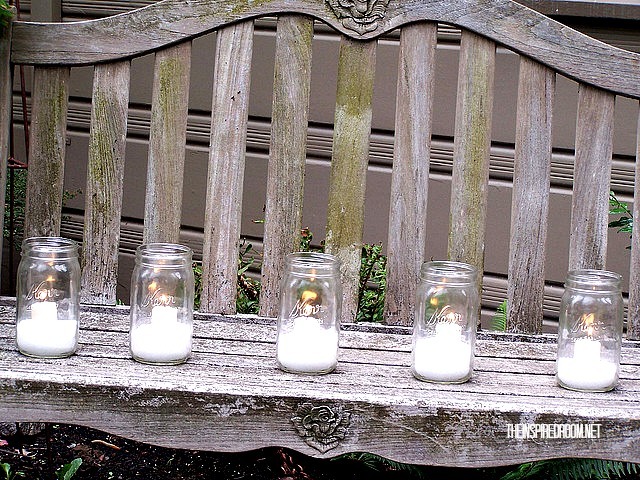 Love a simple idea and an easy craft. 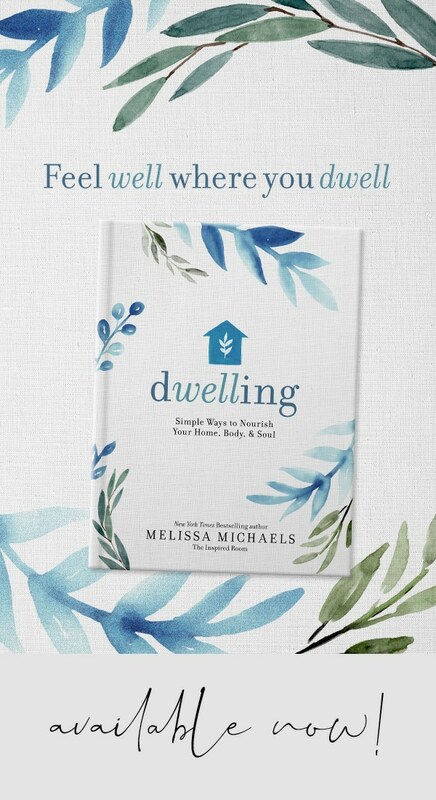 Want more ideas like these? See below! 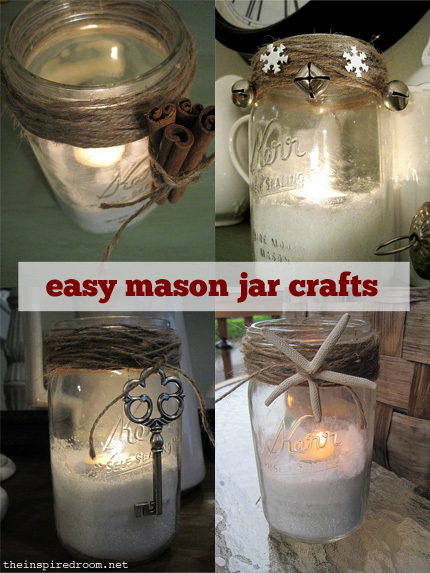 Check out my Jingle Bell Mason Jars! Christmas Trees in Unique Containers! I saw this Christmas Tree in a basket over at Southern Living. I love the idea of breaking away from the expected green and red metal stands and “Christmas tree skirts” and putting the tree in a more charming container instead! 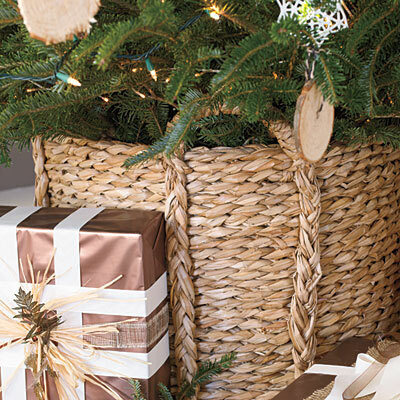 Over the years we have spent many hours cursing Christmas trees that won’t stand up, so I am not entirely sure if this basket idea would actually work for a large tree. Even with a stand inside the basket it might be a little tipsy. But I think it is worth a try! 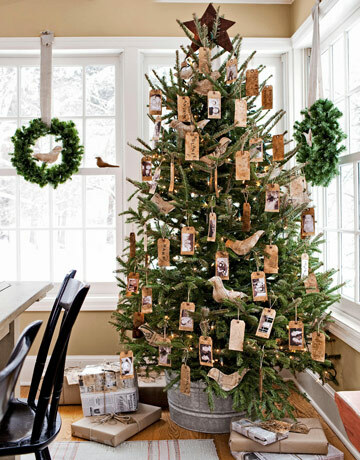 I also love this tree in a big metal tub seen in Country Living magazine. Another charming and interesting idea for thinking outside of the traditional stand and Christmas tree skirt. In this same home they put a smaller tree in a white pot and yet another tree in a large bowl! 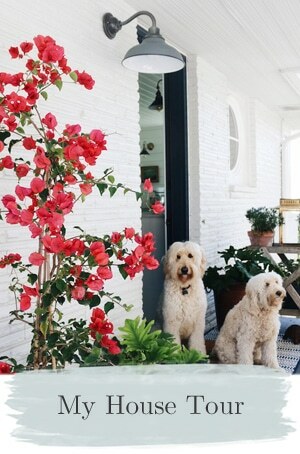 (via Country Living). 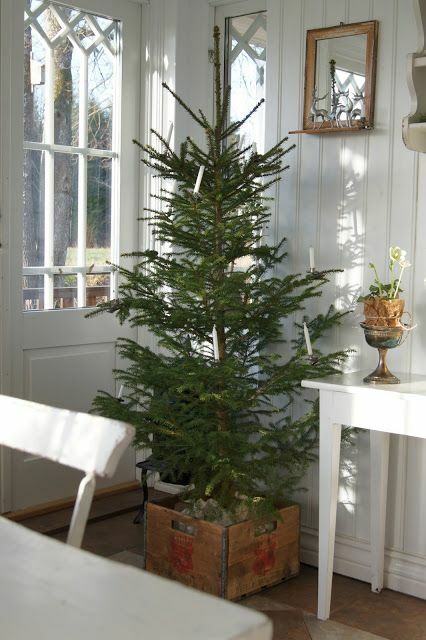 I love this Christmas tree in a wood crate! 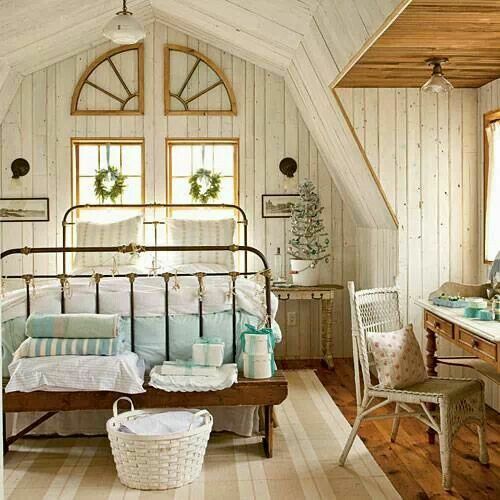 This room from Coastal Living has a tree in a small white bucket with a handle. So cute! I’m loving the simple creative touch of a unique Christmas tree container! 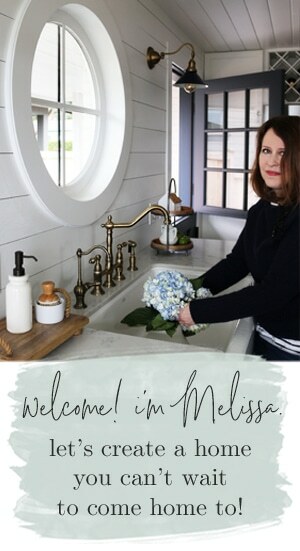 Take my Christmas house tour here and shop my favorite Christmas decor here!